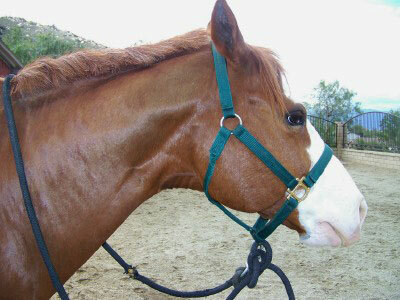 When did this become a suitable alternative to a bridle and a pair of reins? Somehow Wally and I missed that memo. Just this weekend I saw two separate incidences of this offense. The first fellow was riding an eager palomino in a knotted rope halter. The palomino’s head was bobbing excitedly with every step, leaning against the noseband. It was obvious—at least to me—that the horse had long since discovered that it could pretty much go wherever it wanted. It just hadn’t made any plans yet. In response, the man’s elbows were bent in a crimped angle as he strained to keep the yellow horse under control. Fortunately, this daring duo was being followed closely by another man on a big, sturdy sorrel (who was fully bridled), so I figured if the palomino did go rogue there was someone who could come to the rescue. The other man was riding my neighbor’s horse. He’s supposed to exercise the roan mare but I also think she serves as his Babe Magnet. Apparently he’s discovered that it’s easier to flirt with the girls on the high school rodeo team when he’s horseback. Usually he rides the mare in a western bridle, but this time he had her in a nylon halter and lead rope. I passed him while riding Wally. “I have a bridle you can borrow,” I said. I figured maybe he didn’t have access to my neighbor’s tackroom. Then you, sir, are an idiot. If someone wants to plod around their backyard or boarding stable in a halter, that’s their choice. But riding a horse in a halter on trails aligned alongside neighborhood streets is subjecting the poor horse to potential maiming or death. All it takes is one leaf blower, loose dog or noisy motorcycle and that halter is not going to stop—let alone control—the horse. Honestly, I think this trend has become popular because we’re seeing more and more You tube videos of horses performing reining patterns and dressage tests sans bridle. Plus lots of natural horsemanship adherents favor introducing some of the basics to a young horse in a special sort of rope halter. But here are two very important concepts that need to be emphasized: Those fabulous performance horses are highly trained equine athletes with a special connection to their very sophisticated, talented riders. And the colt being ridden in a halter by the cowboy guru? It’s always in a secure, enclosed area. Yet somehow these rope halter trail riders don’t seem to grasp those concepts. Just as before, I am not simply ranting out of self-righteousness. I am speaking from firsthand experience. I learned decades ago that riding a horse in a halter, with a leap rope functioning as a rein, is only fun and cool until the rodeo starts. It was a small black mare, trimmed with white markings, who taught me that lesson. Her name was Oreo, and I exercised her during the week for her owner. One day, after I’d groomed her following a jumping lesson, I decided to ride her up to the golf course that bordered our stable. It had a little clubhouse that sold snacks. Too lazy to tack up Oreo again, and also trusting her benign temperament, I slid onto her back, picked up the lead rope and turned her toward the golf course. I was about half-way there when Oreo decided she’d really prefer to be napping in her stall. She came to a sudden stop and then craned her neck around in the opposite direction. It didn’t matter how hard I tugged on the lead rope; she was heading home. I can still remember how hard the wind stung my face as that little black mare galloped back to the barn. About twenty yards into the trip, I knew I was merely a passenger so I concentrated on just staying on until I reached the cross-ties. So there you have it. That’s why I know that riding a horse in a halter really isn’t a good idea. And out on the trails? Trust me. You really shouldn’t do that. People really are idiots, aren’t they? Unfortunately, there’s usually only one way to fix stupid, and it’s always painful. A bridle and bit is no guarantee either. A panicked horse can grab that bit and go if he really wants to. haha I ride my mare with a rope halter all the time. But she is old and well behaved. I agree you should use a bridle if there’s a chance your horse will act up. I JUDGED A SHOW IN THE DESERT, NEAR PALM SPRINGS, THIS PAST WEEKEND AND WAS TOLD A SAD STORY ABOUT A HORSE THAT HAD RECENTLY BEEN HIT AND KILLED BY A CAR. IT WAS BEING PONIED IN A PLAIN ROPE HALTER BY ANOTHER RIDER. IT SPOOKED, BROKE FREE AND GALLOPED INTO TRAFFIC. THE HORSE DIED INSTANTLY AND THE CAR WAS TOTALLED. SO TRUE, CINDY (AND “LUNA”— LOVE THAT NAME! ), THAT A HORSE CAN BOLT AND RUN OFF IN A BIT, TOO. SEEN THAT HAPPEN SEVERAL TIMES! IT’S THE COMBINATION OF RELYING ON A PLAIN HALTER AND LEAD ROPE FOR CONTROL + BEING ON OR NEAR STREETS THAT CONCERNS ME. lol, thats what show offs get! I ALWAYS ride with a bridle, ever halter. I honestly never even gave that much thought into doing that but now trust me, I won’t even try! Cindy, your stories are always a delight to read! I come here every week to check it out (plus you have a great name lol). AS CINDY/LUNA POINTED OUT, ANY HORSE CAN STILL BOLT AND TAKE OFF IN ANY KIND OF BIT (OR BITLESS BRIDLE) TOO. SO AS RIDERS WE NEED TO MINIMIZE OUR RISKS. AND ANY SORT OF TRAIL RIDING DONE ‘OUT IN THE COUNTRY’ IS A DIFFERENT TYPE OF RISK THAN RIDING ALONG STREETS, ASPHALT AND VEHICLES TRAVELING AT 35mph OR MORE. I will take this into acount the next time I ride.